The wealth of gold in China, Myanmar, Thailand, and Vietnam is also very popular among the people, especially the elders are more precious to gold. Especially in the wedding has an important position. In European countries, weddings basically use diamonds to express their love for their wives, but in Asian countries, gold is the main luxury. At the wedding, birthday, and adulthood, the elders will send a set of gold as a gift to show that the other is important. People. The recipient will tell the donor his love and gratitude for the gift with a smile on his face. The average family daughter is married, and at most, the five-piece gold set includes rings, earrings, necklaces, bracelets, and anklets. No matter how difficult the family is, the five-piece parent will try to buy it. The mother will not marry her daughter. Tears help the bride to wear, let the bride gracefully wait for the groom to pick up. The above photo is the reason why I said that I will surprise you, just as why I would say the wealth represented by gold. The gold that hangs all over it can attract everyone’s attention. In Asian countries, many men are not rich enough, they can’t get the bride because they can’t afford a gram of gold, but the rich families are different. Because we are familiar with this situation and we are used to it, we can’t change it, so our company can only design some relatively luxurious and affordable jewelry to target Asian cities, hoping to help some married boys can afford gold and jewelry. Bring the beloved bride home. The birthstone for each month is a matter of contention. Not everyone agrees with each other when it comes to which birthstone represents which month. We have followed the most traditional opinions. In the situation where there are a few stones, we’ve only added the most popular stones.Navigate the months and discover more about your month’s birthstone. We also placed links to shop the birthstones. Garnet is usually thought of as being a rich red color but, in fact, it is mined in a wide range of tones. The widely differing composition of garnet deposits produces yellow, red, brown, black, green and blue stones. It is the red, pyrope garnet that is the January birthstone. The garnet symbolizes trust and friendship. Amethysts occur in colors from lilac to deep violet and, occasionally, red. Its name comes from the Greek for “not drunk” (a methysto) and was used to give the wearer a clear head and sound judgment. Whether it worked then we’ll never know, of course, but it’s a nice thought. Aquamarine is usually seen in a pale blue color, but it can also be such a deep tone that it is sometimes mistaken for sapphire. Considered a symbol of hope, health and everlasting youth, its association with March is apt. As the herald of spring, when new life bursts forth, what better or more beautiful a birthstone? Diamonds are forever, or so it is said, and will therefore forever be associated with love and the heart. White diamonds are the most common color, but everything down to black is possible. Diamond is one of only 4 truly precious stones along with ruby, emerald, and sapphire. The name neo-classical describes anything inspired the art of Greece and Rome in ancient times. 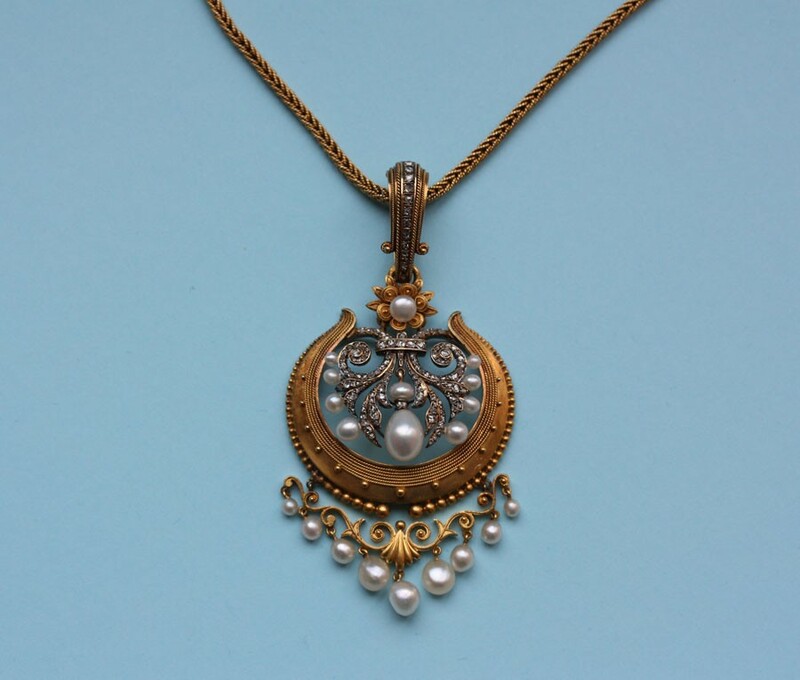 With the English trend towards lighter, more sophisticated jewelry, neo-classical soon overwhelmed Rococo. Within the broader neoclassical period, two separate sub-styles emerged. The first was the Adam Style, as created by architect and interior designer Robert Adam. The style went back to the symmetry of the earlier Baroque period, but with much more subtlety. Motifs in the Adam Style included pillars, flower wreaths, bows, ribbons, hearts, snakes, rams heads and other ancient symbols. The other neoclassical style popular in both England was Regency. Regency style closely mirrored that of the Empire style in France. Although classical symbols were still popular, Greek motifs had largely lost out in favor of ancient Egypt. Compared to most neoclassical jewelry, Regency pieces were far more decorative and colorful. Not quite back to the styles of Baroque, but certainly bolder than Rococo. In order to separate Adam and Regency styles, Regency is often termed as late-Georgian. The name neoclassical is primarily a description for the Adam Style. When choosing necklaces for necklines, you need to be conscious of the specific neckline. 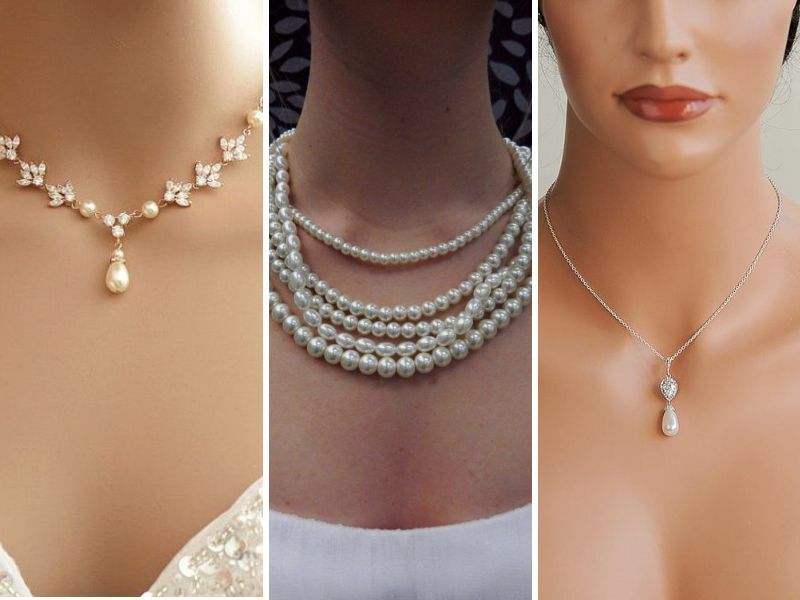 Different necklaces look good with different necklines. Inversely, some necklaces don’t complement certain necklines. V-neck necklines draw people’s attention to your chest or cleavage. Your necklace should do the same.The pendant of a V-neck necklace should be angular and match the shape of a V. The wider the V, the bigger the pendant you should choose.Choosing a rounded necklace with a V-neck makes your appearance look mismatched. With a plunging neckline, your necklace length should be proportionate to your chest.Stay away from necklaces that are too long. They will pull the attention away from your neckline. Chokers pair best with strapless necklines. Choker necklaces draw the attention to your neck and away from your stomach.Go for shorter pendants. They’ll keep the attention on your necklines and collar bones. Shorter pendants can also accentuate your neck.If you want to de-emphasize your neck, wear a princess necklace. This will keep eyes drawn towards your shoulders. Sweetheart necklaces emphasize your neck, shoulders, and sometimes cleavage. Your necklace should contribute to this effect.Choose a necklace with a wider pendant to balance the open space in your neckline, but not too big. Going for curves and soft angles instead of rigid, hard angles will balance the sharp angles of this neckline.Make sure your necklace length isn’t too long. Chokers and princess necklaces will keep the attention on your chest. Shorter necklaces work well with crew necklines. A choker or princess-length necklace will emphasize your neck.Bib-style necklaces also complement crew necklines.Select a more curved pendant for crew necklines instead of angular ones. Rounder pendants go well with this curved neckline. Our collection of fine jewelry set with Swarovski Simulated Diamonds is a very popular choice offering the appearance of perfect diamonds at a fraction of the price. 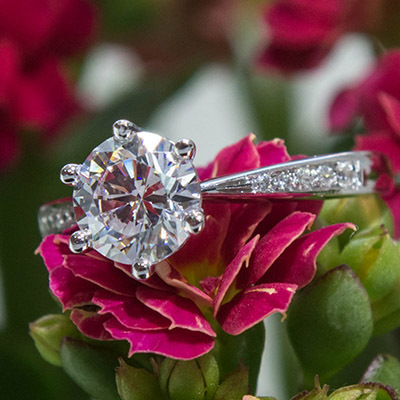 Swarovski have managed to create one of the top diamond simulants in the market cutting their stones to GIA standards. The Swarovski Rings have the same level of brilliance and sparkle as colorless flawless diamonds. They come in various sizes , the most popular being a 1 carat. These Pure Brilliance Stones can withstanda high temperateues, they are durable and ideal for daily wear. Each stone is microscopically engraved to prove its authenticity. We also provide a certificate stating so with each one of our rings. The laser engraving on the center stone and on the sidestones is nearly invisible and cannot be seen with the naked eye nor does it interfere with the brilliance of the stone. The Swarovski pierced earrings collection features a vibrant selection of stylish accessories for the modern woman and showcases the brand’s renowned precision cut clear and color crystals. The pierced earrings collection includes urban rhodium-plated hoop earrings featuring sparkling Fuchsia, Amethyst and clear crystals set in pavé; classic gold-plated pierced earrings with a single clear crystal chaton framed in clear crystal pavé; vintage-style palladium-plated drop pierced earrings in an elegant gradation of pastel blue crystals, and bold rhodium-plated Crystal Mesh pierced earrings. These are just a few shimmering examples of Swarovski crystal pierced earrings. Created for the fashion forward woman and for every occasion, Swarovski pierced earrings embody the brand’s innovative design and sparkle in a dazzling array of clear and crystal colors. Enhanced every season with spectacular new pieces, the beautifully crafted pierced earrings collection can be worn with matching Swarovski necklaces and bracelets to enhance any outfit. 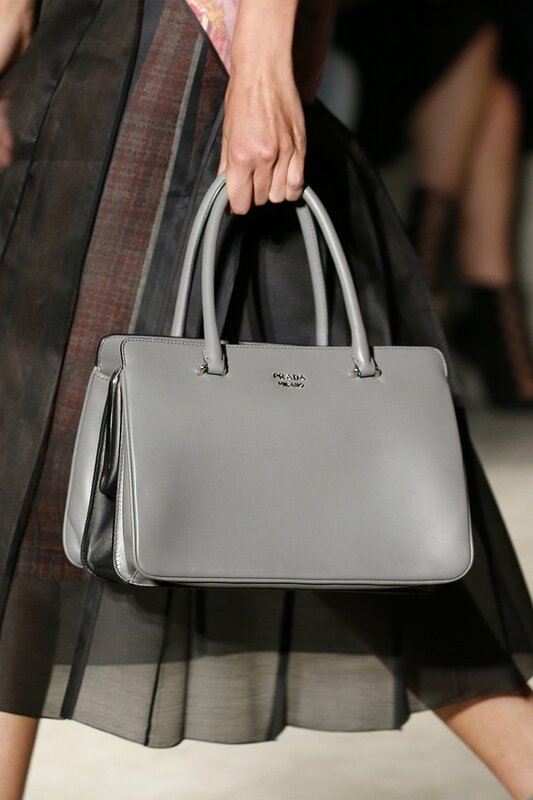 Prada changes things up so much from one season to the next on its runways that I didn’t have any terribly specific for predictions for what kinds of bags would grace the brand’s Spring 2018 runway, and if I had tried to guess, I would have undoubtedly come up far short of what Prada ultimately put together: a fun, aggressive, but not-too-serious slew of bags with punk details, inspired by the gritty world of comic book heroines. The bags with illustrations (which will be immediate street style fodder, it goes without saying) are cheeky and very much in line with Prada’s occasional tradition of using artwork on its bags—most notably the fairy bags of the mid-2000s—but that’s not all the runway offered. There were also excellent, simple leather bags that the brand hasn’t shown before, as well as super-functional nylon pieces accented with studs and straps, bridging the gap between the brand’s longstanding lines and the seasonal bags. They looked like the kind of pieces the women in the illustrations might carry on their quests to stylishly save the world.Check out all the pieces from the runway below. The duo’s comments angered some very high-profile people, including Sir Elton John and his partner David Furnish, as well as NBC’s Today Show host Al Roker, who both leaped to the defence of non-traditional families on social media. Admittedly, this is an odd stance for to take. While the pair (who were themselves a romantic couple for over 20 years before splitting but remaining business partners) may have their reasons for wanting to promote what they perceive as the institution of a traditional family unit, in light of their comments, their Fall/Winter 2015-2016 shoe seems to take on an altogether different patina; one that is more socio-political commentary than homage. Some have even argued that if the duos believe that the family unit is indeed “not a fad”, it may perhaps not have any place being on the runway at all, making their campaign exploitative at best. As with many things in and around the fashion world, the true test will likely be whether or not customers are willing to embrace Dolce and Gabbana’s campaign. There is perhaps no better marker of how a collection is received than the popularity of its associated handbag line. The LaMamma handbag will almost certainly divide the crowd; its sophisticated shape and elegantly finished hardware are in stark contrast to the embroidered, childlike embellishments on the bag. With a price tag of nearly $3,000, we’re predicting that it’s probably going to be a tough sell. After all, the women (many of whom are mothers) that make up their core demographic are nothing if not pragmatic. Dolce and Gabbana appeared to present a collection that was all about celebrating traditional Italian motherhood. Pregnant models walked the runway, while others carried babies and toddlers in their arms. It all seemed very heart-warming; a celebration of the circle of life with Dolce and Gabbana’s signature heavy-handed Italian spin. But that was before the interviews.